KIEV, Ukraine -- Ukraine wants Russia to decrease the gas prices in the contract signed by both governments in January 2009 when the gas conflict between the soviet republics left European consumers without Russian-supplied gas. Employees at a gas-compressor station Orlovka near the Ukraine-Romanian border. Ukraine wants Russia to decrease the gas prices in the contract signed by both governments in January 2009. Ukrainian officials said the gas price for its consumers is higher than the price Russia charges its neighbors. In the first quarter, Ukraine paid $305 for 1,000 cubic meters of gas consumed, and the price is set to rise over the next quarters. 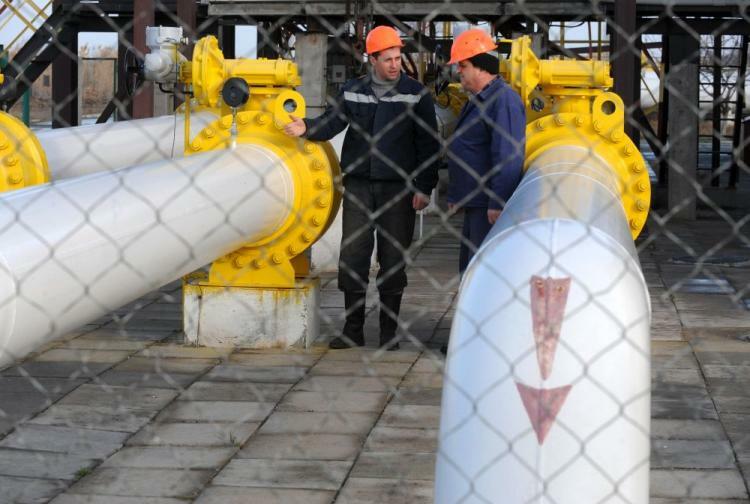 According to analysts, if the gas price is not fixed the national gas company Naftogas will continually experience financial difficulties. Last year, Naftogas had a lot of trouble with monthly gas payments, caused by its shadow activities, and the government had to step in and use funds given by the International Monetary Fund (IMF) to bail the company out. During his official visit to Moscow last week, Ukrainian Prime Minister Nikolay Azarov, attempted to negotiate the gas price down, but his counterpart, Vladimir Putin, refused to budge. Putin kept the dialogue open, saying he welcomed continuing discussion on the matter. Russia appears to be leveraging its position to push Ukraine into joining the custom union before considering decreasing the gas price. Belarus and Kazakhstan have already joined the custom union. The union will see the abolition of customs duties on trade goods between participating countries, as well as enforcing common external tariffs with third parties. Analysts say that joining the custom union with Russia's leading role will be trapping Ukraine into letting the Kremlin control more business in the country and would contradict with their membership in the World Trade Organization. The Ukraine Parliament is looking to pass a bill for nonalignment status soon. The President of Ukraine Victor Yanukovych himself claimed that Ukraine did not join any military alliance, but kept cooperating closely with NATO. Ukrainian officials have said that restoring friendships with Russia should be a priority, along with their relationship with Europe. “Without that, the progress of Ukraine cannot be provided in short ... medium and long terms perspectives,” Ukraine’s Minister of Foreign Affairs Kostyantyn Gryshchenko told Ukrainian reporters in Brussels last week. Meanwhile analysts claim that no syndicates should be formed with Russia as it wants to absolutely control the gas transportation market because it fits its strategy to become the centre of redistribution of all gas streams in Europe-Asia continent by 2030. “Russia is naturally being a monopolist,” Volodymyr Omelchenko, an energy expert of Razumkov Centre said in his column. After European consumers were left without Russian gas, the EU leadership started negotiating on building an alternative gas transportation system, called Northern and Southern streams, that originate from Russia and avoid transfer through Ukraine. At the same time, Kiev could commercialize its gas transportation system under a ruling signed in Brussels last year that saved Naftogas from collapse but chose not to. But experts say commercialization of the company would allow it to become more independent and stable. “The country must become the energetic bridge between Russia and Europe. We should take from Russia … the resources base while considering Europe to be financial and economical components,” said Alexander Chaliy, an energy expert. A consensus has not yet been reached at the official level as the gas negotiations only started last week. Any gas price changes are expected to be agreed upon next month when Russia’s President Dmitry Medvedev officially visits Kiev.